Michael McFadyen's Scuba Diving - Riko Riko Cave, El Torito Cave, Poor Knights, NZ The southern of the two major islands of the Poor Knights Islands in New Zealand is called Aorangi Island. 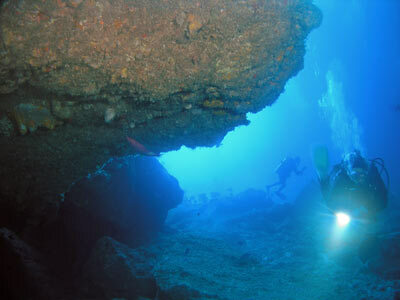 About half way along the western side of the island is Riko Riko Cave. 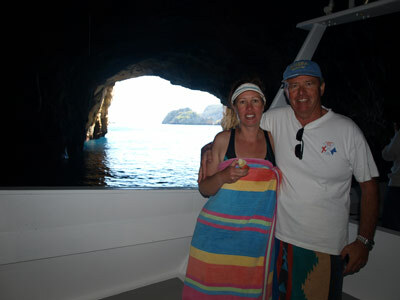 This huge sea cave is an iconic location at the Poor Knights and can be entered by even the largest of the boats that go out to the islands for diving and sightseeing. 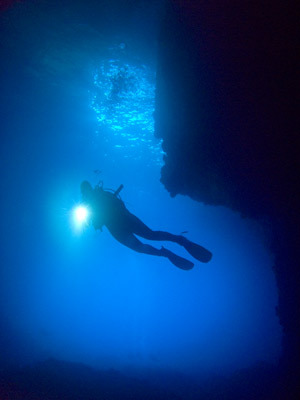 Riko Riko Cave is the world's largest sea cave in terms of volume. It was measured at 221,494 cubic metres (7,808,771 cubic feet sounds so much bigger!) 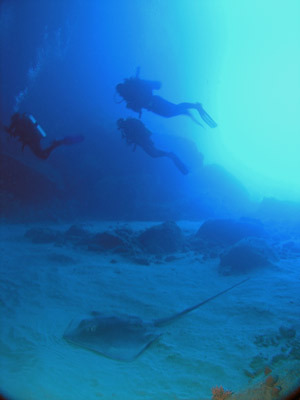 with 42.5% of the cave underwater. This was measured by Jeremy Elrick, a surveying student. His study showed the cave is 152.7 metres long (measured I think from the furtherest point at the back right of the cave to the overhang on the eastern side of the entrance), 96 metres wide and 38.1 metres high. It is a certainty that when you go out to the Poor Knights you will at some stage go into the cave in your boat. Once you do this you will truly realise the enormous size of the cave. The cave entrance is GPS A GPS of S35º 28' 53.1" E174º 44' 02.9". You should anchor at GPS S35º 28' 52.8" E174º 44' 04.9" (using WGS84 as a datum). 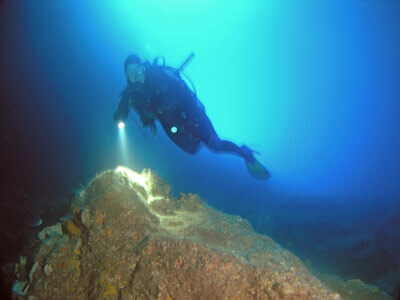 This is to the east of Riko Riko Cave. Make sure you are well clear of the entrance. 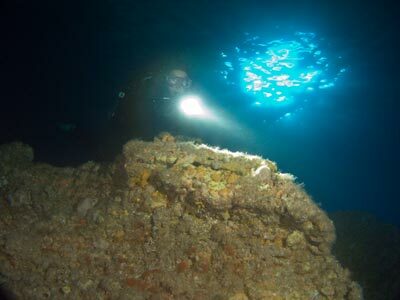 The main part of the dive site here consists of entering Riko Riko Cave itself and then spending the remaining time on the wall outside near the boat. Of course, you need to make sure that you avoid the centre of the cave near the rear section as when the larger boats come inside, you could get stirred up by the turbulence from the boat's props. Certainly, never surface in the middle of the cave, make sure you only come up a wall. Once you enter the water, descend and head over to the wall. Turn right and head west. 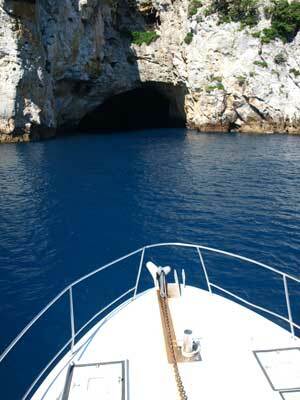 Once you see the entrance of the cave, drop to the bottom and you will see that it is about 26 metres deep. The bottom is sand with some rocks interspersed between. Continue over the sand to the other side of the entrance. You should be able to see the other side before leaving the wall as the visibility is normally at least 30 metres. 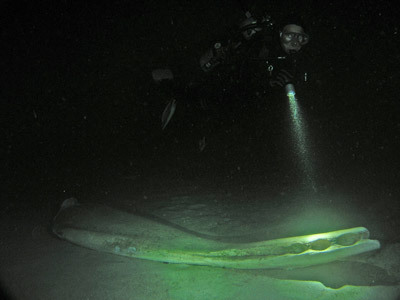 This sandy area is home to a lot of bullrays. There can be as many as 10 here, both sitting on the bottom and swimming around. Once you hit the wall on the western side of the entrance, head south and into the cave itself. 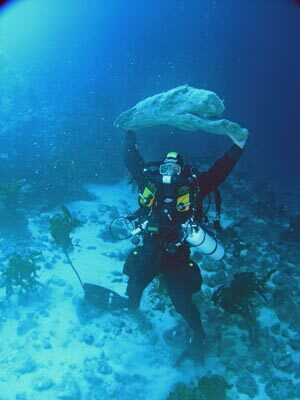 The depth gradually decreases and you will soon encounter some huge boulders. A couple of these have small overhangs or make a gap between the wall. The depth will be about 15 metres here. Look back out of the cave at regular intervals. Also listen for boats coming in and look up at them as they drive pass. In this area, probably towards the middle of the entrance, you will come across the first of some bones from a sperm whale. In May 2010 a 15 metre long sperm whale that had died was washed into the cave. At first the whale carcass floated. It was mostly in the back right corner and as can be imagined, it got very putrid and smelt like hell. Eventually it broke up. Today, the bones are all that remains of the whale. They are spread out all over the cave, with some near the middle of the entrance and the majority in the back right (south-western) corner. The main bones near the entrance are some vertebra, these are huge (see the attached photograph). The depth in the middle is just under 20 metres. Soon it will get quite dark, although there is always some light filtering inside. You are better off with a torch as it will help you find the interesting things inside. Apparently there are black coral trees here as the low light levels makes them think it is much deeper than their normal home. The bottom is now mostly rock and the depth comes up to about 12 metres and then 10 metres. You will also see more of the sperm whale. Behind some large rocks in the back right corner, there are two sections (at least) of the jaw. These are huge, at least two metres long. You can see where the teeth fitted into the jaw, although they are not present. There are also vertebra as well. You will now head east across the back of the cave. 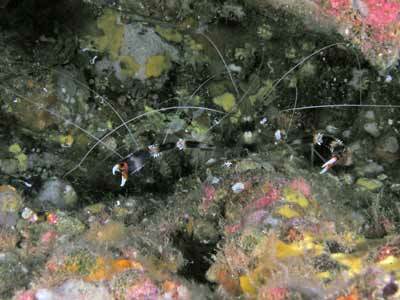 The depth mostly hovers around 10 metres, but at the middle of the back of the cave comes up to under five metres. You will now be at this depth for more than a metre before you start dropping back down again to the 10 metre mark. Soon you will hit the back left corner and turn more to the north. You have probably been down about 35 minutes by this time. The bottom here is rock but soon it becomes pebbles and then sand. The depth will start to increase back towards 20 metres. As you approach the entrance of the cave on the eastern side, you will see a huge rock ahead just off the wall. This is shaped like a pyramid. It is about 20 metres at the base and 10 metres at the top. You can see divers in the above photograph which gives some scale to the pyramid. You will soon come to the outside of the cave, follow the wall and head east. Spend the rest of the your time on the wall, gradually ascending as you go. 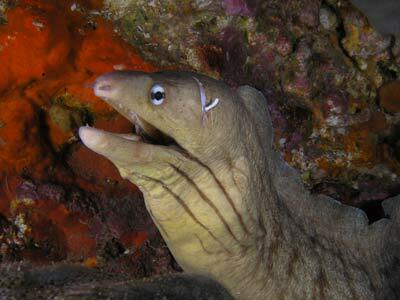 There is some nice life on the wall, many eels and nudibranchs. We did about 65 minutes on this dive, you cover quite a long distance, but there is no current or surge and you slowly work your way around the site. 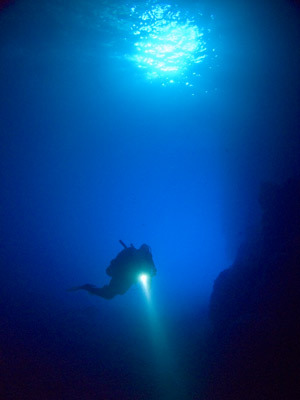 This is a brilliant dive, with the unique feature of being inside the largest sea cave in the world. 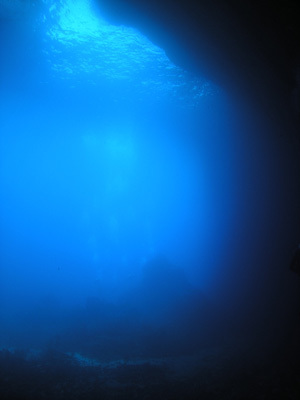 It is probably best done as a second dive as the sun will be in a better position (throwing more light into the cave). In winter it is also better, again as the sun will stream in the cave a lot more. 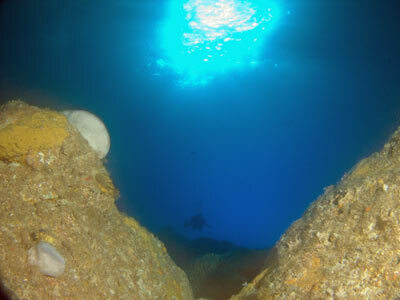 When we dived here we had 40 metre visibility. The water temperature was a lovely 21ºC.